It’s been over 18 months since Xiaomi announced the Mi 4 back in June 2014, and today the company is finally ready to release the sucessor in the form of the Mi 5. 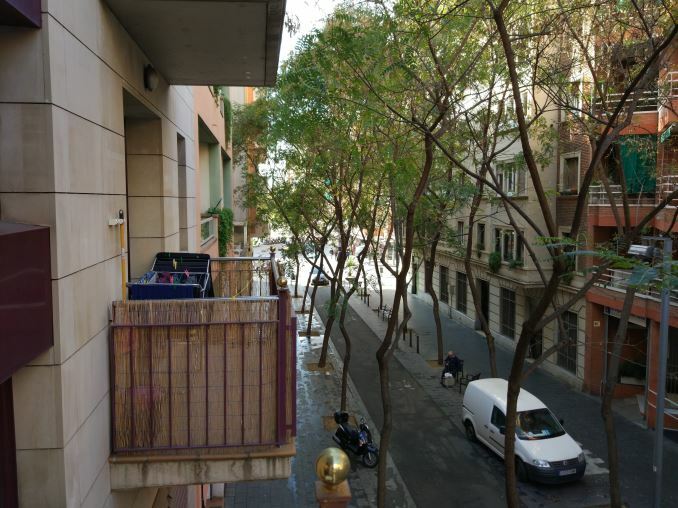 The western launch here in Barcelona was presented by VP of Global, Hugo Barra, and we were lucky enough to have the opportunity to live-blog the event and get a more in-depth hands-on later in the day. 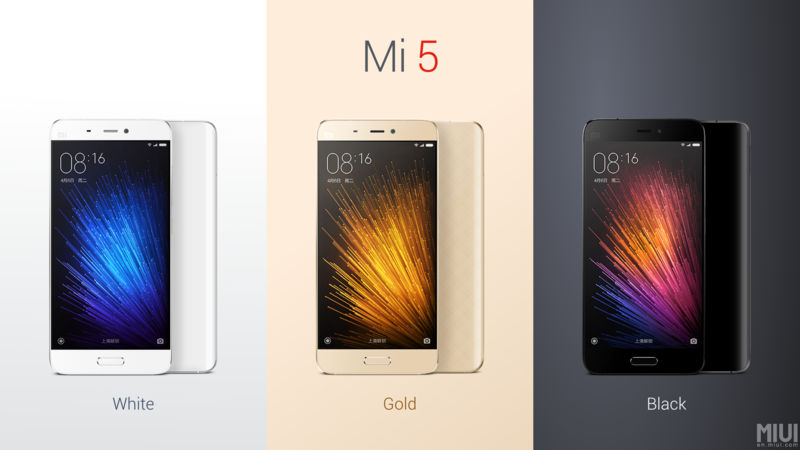 The Mi 5 is Xiaomi’s 5”-range form-factor flagship device and will be one of the main devices competing for buyer’s attention this generation. At the heart of the Mi 5 we find the Snapdragon 820 processor powering the device. Xiaomi chose to use two different variants of the Snapdragon 820 depending on the configuration and price options. The lowest priced option with 32GB of storage comes with a lower-binned Snapdragon 820 whose Kryo cores reach up to 1.36GHz on the efficiency cluster and 1.8GHz on the performance cluster. Furthermore the 32GB version only supports LPDDR4 up to 1333MHz. The 64GB and 128GB options come with the full 1.59GHz/2.15GHz speed bins and 1866MHz memory. Power efficiency of the new SoC has been a big discussion topic revolving the Snapdragon 820 and I know a lot of readers are impatient for new information on the matter, so I took the opportunity to try to measure the power draw of the new Kryo cores on the Mi5. The values presented here are just estimates based on power measurements from the device’s input charge power so there’s likely some voltage converter inefficiency at play and more thorough measurements in the future may result in lower figures. We do see some significant improvements for Qualcomm and the Snapdragon 820 represents a substantial reduction in power over the Snapdragon 810 and 808. At first glance though it seems Qualcomm isn’t able to beat HiSilicon’s Kirin 950 in terms of efficiency – although it looks like it will be able to display better efficiency than the Exynos 7420. A bit worrisome was the rather high 1 core power load but it’s still too early to determine if this is CPU-core related or rather power from another SoC block. Nevertheless it seems that the Xiaomi Mi5 and other Snapdragon 820 devices should be able show off concrete improvements over last year’s flagship phones. On the GPU side we see some good improvements as well, although it seems the Snapdragon 820’s GPU is yet again oversized for smartphone form-factors as power figures are well above sustainable thermal envelope of phones such as the Mi5, so significant long-term throttling should be expected. 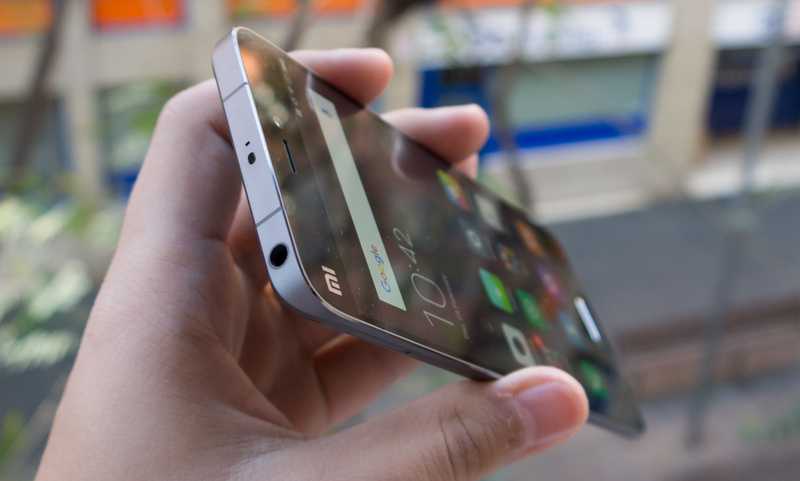 Continuing on with the rest of the MI 5’s specifications, we find a 5.15” 1080p IPS LCD display. Xiaomi did well in staying with a 1080p display as it will help with DDIC and display controller power to achieve better battery life for device. Xiaomi went one step further to improve power efficiency of the screen and disclosed that they’re using more backlight LEDs than in conventional designs – 16 instead of the usual 12-14. According to Xiaomi, this enables the Mi5 to reach up to 600nits of brightness as well as increasing overall backlight efficiency by 17%. While we still have to verify all of these claims, what I did notice is that the quality of the IPS panel that Xiaomi uses on the Mi5 is excellent. The display’s viewing angles are among one of the best I’ve seen on an LCD panel so it’ll definitely be interesting to see if Xiaomi was also able to provide accurate colour reproduction. Further hardware specifications on the internals of the device include a switch to UFS-based NAND storage which promises to reach data-rates of up to 450MB/s – a figure that I wasn’t quite able to reach as quick testing shows the NAND speed reaching only 239MB/s read and 30.76MB/s writes (AndroBench 4.0, 256/4KB buffers, 1 thread). It’s possible that Xiaomi is quoting numbers without encryption and FDE on Android 6.0 is slowing down the maximum achievable speeds by the hardware. Design-wise, this might be Xiaomi’s best device to date. The designers were able to adopt the Mi Note’s bevelled back sides to achieve excellent in-hand feel. To improve on the Mi Note's design which only curved half-way through the side of the device, the Mi5 now also curves the metal frame to try to give a more continuous feel between the metal and the glass/ceramic. Although the device sports a 5.15” screen, thanks to the design it feels more like a 4.7” or smaller device. The in-hand feel is reminiscent of the Galaxy S7 and I’m definitely happy to see that companies this year focused on improving their ergonomics. The only area where I wish Xiaomi had improved a bit more was on the front edges of the device as the lack of 2.5D glass does accentuate the rather sharp feel of the metal frame on the front. I mentioned glass/ceramic earlier, and yes, there is a distinction between glass and ceramic as the MI 5 will come in three variants with two options for the back material. The cheaper 32 and 64GB variants will come with a more traditional glass back, while the 128GB variant comes with a more premium ceramic back cover. Advantages of the ceramic version will be that it'll be much more scratch resistant due to the hardness of the ceramic. One thing that wasn't mentioned during the presentation, but does make a large difference in the device's rather light baseline weight of 129g is that the ceramic back adds in 10g more which was definitely noticeable when holding both variants of the phone. The right side of the device sports a power button with a volume rocker above it. We find a SIM tray on the upper left side of the phone. At the top we see a IR blaster, microphone hole and the 3.5mm headphone jack. The bottom features a USB-C connector which is flanked by 4 speaker holes on each side, although similarly to Huawei’s devices only the right side contains a speaker as the opposing speaker grill serves only as a symmetrical design feature and housing for the main microphone. 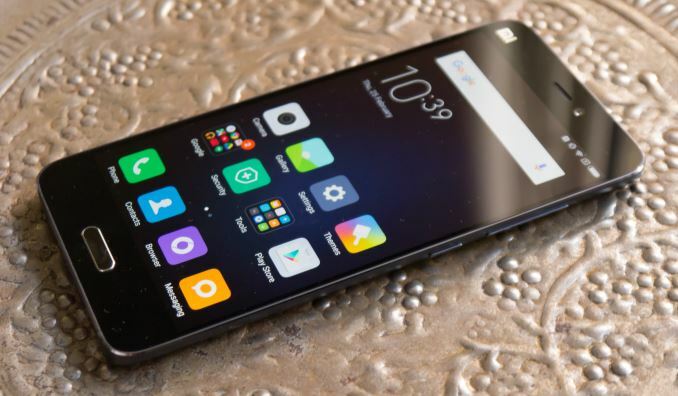 The MI 5 is Xiaomi's first smartphone with a physical home button. Primary reason for this is the new inclusion of a fingerprint sensor whose accuracy I found to be quite high. I was also very impressed with the implementation of the device wakeup feature: If you wake the device via the home button then it will immediately unlock the device without showing the lock-screen, not requiring a second gesture or trial & error with reading the fingerprint after the initial press. When the device is unlocked the fingerprint sensor also acts as a capacitive button so you never actually have to press the button during normal usage beyond initially waking the device up, effectively enabling full capacitive button navigation for the Mi5. On the camera side, Xiaomi has made a lot of improvements to the camera module. The Mi5 sports Sony's new IMX298 16MP sensor which sports phase-detection autofocus for fast focusing and deep-trench isolation for better colour reproduction and reduced noise. We saw the same sensor employed in the Mate 8 and while I wasn't yet able to published the revisited camera evaluation of that device, I wasn't overly impressed with the results of the camera, so hopefully Xiaomi this did a better job on the image processing side of things. The MI 5's optics consist of a 6-lens system with an aperture of F/2.0 and an 35mm equivalent focal length of 28mm. 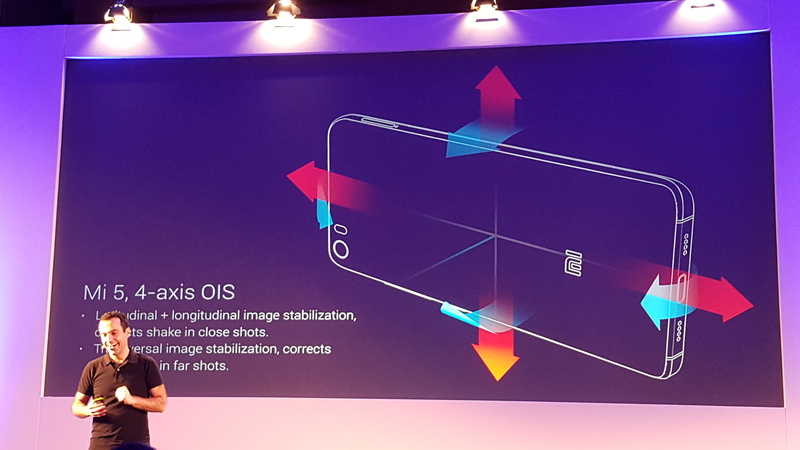 A first in the smartphone industry is the introduction of a 4-axis optical image stabilization system which introduces transversal image stabilization on top of latitudinal and longitudinal stabilization. Effectively, the module is now able to move around sideways on a plane on top of correcting its pitch and yaw. The end result is quite impressive and represents one of the best OIS systems in current smartphones. The only thing missing now for a full-fledged 5-axis OIS system that can compensate any kind of shake is an added axis for rotational image stabilization. Initial camera samples seem favorable to the Mi5 and are definitely a large improvement to past camera modules employed by Xiaomi. The interesting comparison here is again seeing the MI 5 against the Mate 8 as both employ the same sensor and similar optics with the same aperture - the difference being in other areas such as the image processing. 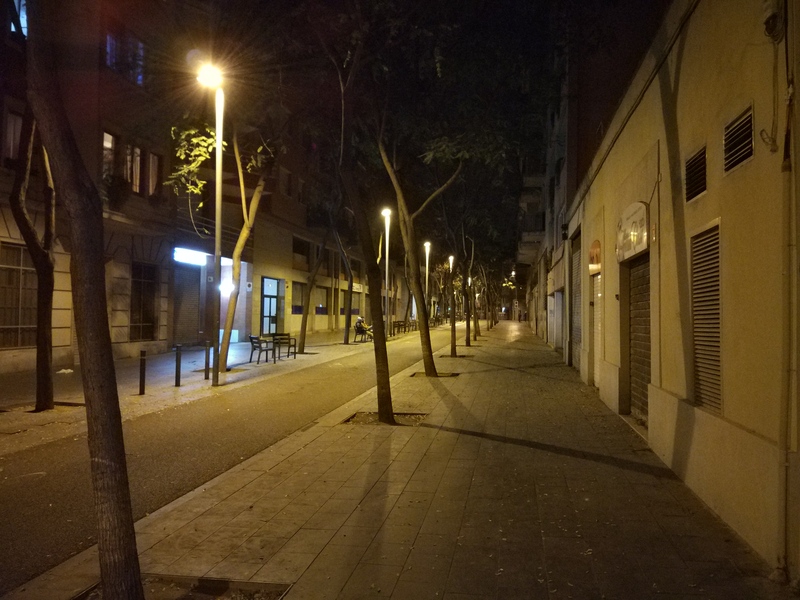 In low-light situations the Mi5 performs well, but it's during the daylight where the Mi5 seems to shine as it's able to take some very good pictures. Performance was a large focus-point during the Mi5’s presentation. The Snapdragon 820 is touted to bring a lot of speedup, but this doesn’t seem to materialize as well in most situations. In browser tests, the Mi5 doesn’t seem to be able to deliver much improvement over the performance scores that we benchmarked back in December on Qualcomm’s MDP/S platform. Xiaomi’s stock browser doesn’t look like it’s been optimized for the Kryo cores and thus doesn’t represent any improvement over Chrome, which is also testing relatively low versus competing ARM cores in the Snapdargon 810 and Kirin 950. PCMark presents the same result when it comes to web-browsing, scoring lower than what the Snapdragon 810 could achieve. The writing score is an important test for overall Android performance and the MI5 performs well here, although it gets beat by the Mate 8's Kirin 950 SoC. The photo editing score is a GPU performance test and here of course the Mi5 performs admirably thanks to the powerful Adreno 530 GPU. We weren't able to install any applications on LG's G5, so the Mi 5 serves as the first consumer device to confirm the benchmark scores we got back on the MDP/S platform. Here we see the Mi 5 perform very well and even slightly outpaces the MDP device, maybe due to newer drivers. Again it's to be noted that the device can get hot and preliminary power measurements show that it's very unlikely that the Mi 5 will be able to sustain these scores for extended periods of time. The Mi 5 will be available in white, gold or black versions in three different options with either 32, 64 and 128GB for respectively RMB ¥1999 (USD~261, ~236€, ~187£), RMB ¥2299 (USD~300, ~272€, ~215£) and RMB ¥2699 (USD~352, ~319€, ~252£), non-Chinese prices converted without taxes. Xiaomi hasn't commented on availablility outside China or cellular band compatibility, but it's expected that the Mi 5 won't be compatible with NA carriers. European users will be more lucky to see LTE compatibility although it's unlikely that we'll see support for the important Band 20. Overall I was fairly impressed with Xiaomi's new flagship device. The screen and design are definitely the highlights of the device. The Snapdragon 820 seems reasonable and represents a large improvement of Qualcomm's previous generation of SoCs. 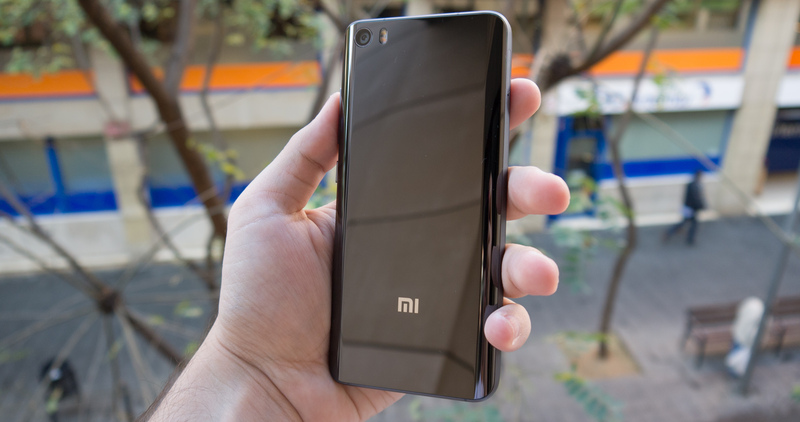 While there's still a lot more to test for the upcoming full review, in the short time I had with the device I didn't find any outstanding faults with the Mi 5 so it looks like Xiaomi was able to pull off a quite outstanding device that seems to be hard to beat in terms of price/performance ratio. Look forward to the full review in the upcoming weeks. "and today the company is finally ready to release the predecessor in the form of the Mi 5"
Xiaomi definitely came through...wasn't there that one US company that is getting Xiaomi phones to sell like a carrier? We may see some light for NA compatibility. That company (some two-bit MVNO riding on T-Mobile's network) was planning on importing gray-market Xiaomis from Hong Kong and selling them without any support from Xiaomi whatsoever, and set world records in backpedaling after Xiaomi explicitly denied working with them and T-Mobile threatened to terminate their MVNO agreement for selling non-approved devices for use with T-Mobile infrastructure. I really wish all of Xiaomi's stuff would be more available here in the US. They make some really nice stuff for penny's on the dollar compared to the "big names" here.